We are moving towards a singularity in the history of human kind: globally interconnected, integrated, and accessible machine readable knowledge, vastly improving human problem solving capabilities in business, science and society. Inspired by Vannevar Bush and his ideas of the Memex, made concrete by Doug Engelbart when he described how to augment the Human Intellect in 1962, enabled by the Internet and the Web invented by Tim Berners-Lee, finally now all building blocks are in place and are coming together. It provides the means to combine and access the world's knowledge at a time when the world is experiencing challenges which require all our combined knowledge and ingenuity. Enabling and exploiting this singularity, which we call Networked Knowledge, for the benefit of humankind is the goal of my work. One of the most promising areas where this can benefit humanity is Scientific Knowledge. Linked Data and the Semantic Web is the foundation for Networked Knowledge - the raw material. Linked Data and RDF provide the two basic principles to create a global data network: these are the ability to globally identify entities and the ability to create relationships between these entities. We see Linked Data now growing and co-evolving world-wide in many different parts of society. Now network effects following Metcalfe's law based on the additional value created by interlinking data are accelerating the growth, initially within specific domains, but more and more across domains, reflecting that knowledge is inherently connected and shouldn't be limited by artificial boundaries. Science Foundation Ireland produced a great introduction to DERI and our goals and ambitions. DERI and the SFI Research Program is now in the past and has transitioned into the Insight Centre for Data Analytics, and I have transitioned to Fraunhofer FIT and RWTH Aachen, but my research vision remains valid. And here is confirmation that part of it transitions already into reality: 10 years after we introduced the concepts in the "Social Semantic Desktop Paper" and the subsequent Nepomuk project Microsoft implements a Semantic Desktop - see the brain? Now if only Office Graph would work also with non-Microsoft products - and maybe even across systems...? Maybe build the capabilities into the operating system? I am a professor at the RWTH Aachen University, and a Director of the Fraunhofer FIT Research Institute, part of the Fraunhofer Society. Previously I worked at the National University of Ireland, Galway and as the Director of the Digital Enterprise Research Institute and later Insight at NUI Galway (12 years), at ISI, University of Southern California (2 years, Research Assistent Professor and Computer Scientist), Stanford University, Computer Science Department (Database Group) (3 Years, PostDoc and Research Associate), and Institute AIFB, University of Karlsruhe (now KIT Karlsruhe) (4 years, PhD Student and Junior Researcher). My main research field is the Semantic Web. The usual academic self promotion: my Google Scholar profile claims my publications have received more than 15000 citations and I have an h-index of 59 (the h-index is a metric aiming to measure scientific productivity). Google Scholar also searches authors per organisations (e.g., all authors in Google Scholar from NUI Galway) or even (exploiting the country code) from a country like Ireland. I also maintain a Linked-In profile. My team and myself (mostly my team) drafted the governmental Irish Open Data Strategy and provided the alpha version of the Ireland's Open Data Portal. After I took over the Directorship of DERI in 2006 DERI had doubled in size and far more-than-doubled its scientific output and reputation. According to Microsoft Academic Search until DERI transitioned into the Insight Centre for Data Analytics, DERI was recognised as one of the top organisations in World-Wide-Web research. For these successes DERI was selected by SFI for inclusion into the Insight Centre for Data Analytics, enabling research funding for another 6 years. I coined and established the term Social Semantic Desktop for Personal Knowledge Management with Semantic Web Methods and initiated a large scale EU project (Budget: 17.5 M Euro) dubbed NEPOMUK which included multinationals like IBM, HP and SAP, small companies like Cognium, research institutes like FZI, DFKI, L3S and DERI, application partners like Institute Louis Pasteur, and a dissemination partner like Edge-IT (Mandriva Linux). The goal of the project was to provide a crystallization point for the development of the Semantic Desktop infrastructure. The results are now part of KDE and distributed with Linux. I initiated and co-organized (with Isabel Cruz, Jerome Euzenat, and Deborah McGuinness) the Semantic Web Working Symposium at Stanford University, the first large scale Semantic Web event (> 250 participants), which spanned the International Semantic Web Conference, which is now organized by the Semantic Web Science Association. Together with Ian Horrocks I created an RDF representation for the Description Logic SHIQ. The result was merged with the at the time XML-based OIL. Then the RDF part of OIL was the main input for DAML+OIL (I was member of the DAML+OIL Joint Committee), which in turn was the main input for OWL - the Web Ontology Language. Since I perceived an editing environment as being critical for the success of Semantic Web standards I pushed for Protege becoming Open Source and wrote the first RDF import/export for Protege, which made Protege compatible with Semantic Web standards (see my announcement to the RDF interest mailing list). Protege is still the most popular editor for Semantic Web Ontologies. Together with Mario Schlosser, Michael Sintek and Wolfgang Nejdl we created HyperCuP, the first Ontology-based routing algorithm and hypercube topology for P2P networks (the main genius behind HyperCuP was Mario). HyperCuP has been used by a couple of projects as a P2P topology. Together with Wolfgang Nejdl I cofounded the Edutella project, the first metadata exchange infrastructure for RDF. The Semantic Web information foodchain presented in an ECDL 2000 paper and depicted at SemanticWeb.org is widely used as an architectual model and motivation for Semantic Web technology. While being at Stanford University as a PostDoc (without having finished my PhD at the time) in 1999 I acquired a 1 M US$ grant from DARPA (DAML, Ontoagents, PI: Prof. Gio Wiederhold). I was named key person for the grant, which means the grant would have stayed with me if I had moved. The grant enabled me to establish one of the first Semantic Web research groups. Together with Dan Brickley, Janne Saarela, and Jürgen Angele I created the first Query and Inference system for RDF (see the QL'98 paper). My work on Ontobroker (joint work with Dieter Fensel and Michael Erdmann) was cited as an inspiration for the DARPA DAML program, which heavily influenced the Semantic Web effort and lead to the development of OWL. My PhD thesis on the Semantic Web was one of the first in the field, exploring the use of Semantic Web technologies for Knowledge Management. My undergraduate thesis generalised all at the time known methods for Incremental Checking of Integrity Constraints in Deductive Databases and is the most formal work I have done. It also is the most incomprehensible work I have done. Coincidentally it also is the work with the least impact. The core is a 4 page double induction proof over a data structure representing proofs of Logic Programs done with the SLDNF-resolution procedure. I still believe the described Integrity Checking Method has tremendous application potential (it allows for declarative testing of a data set wrt. to compliance with expressive integrity constraints) and just needs to be modernised, properly explained and properly published (in English, for starters). Maybe I find the time when I am retired. I made national news in Ireland for buying a car during the Icelandic ash cloud incident in 2010, when most of Europe's Air Space was close for commercial flights. Four of us were stranded in Madrid after attending a Future Internet conference in Valencia. I bought a car to drive back to Ireland to be in time for a meeting at Science Foundation Ireland. Amazingly, buying a car turned out to be the cheapest and fastest solution - I was able to sell the car back in Ireland. During our drive back I posted a short report of our activities to get home on the RTE website, where it was picked up and reported on in Morning Ireland, a popular radio show in Ireland. It was also reported on the BBC Website. The original Google Server consisting of 10 4GB disks and a case built out of Lego was for a while in my office in Stanford University. 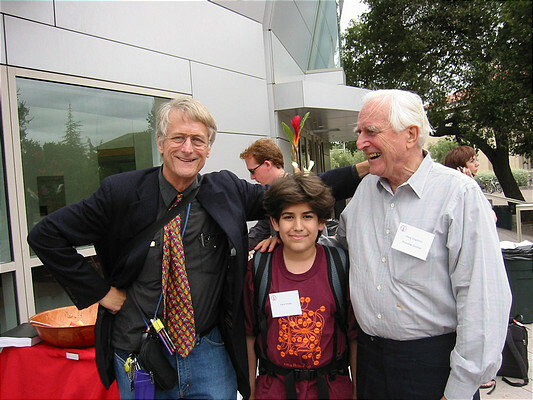 When organising the SWWS in Stanford Doug Engelbart contacted me to speak at the event. I had subsequently several meetings with Doug (including a birthday party that he had for Ted Nelson in his house in Atherthon). These meetings heavily influenced my Semantic Desktop and Semantic Web work.